So they booed and protested at every opportunity they could. I couldn't be more proud. 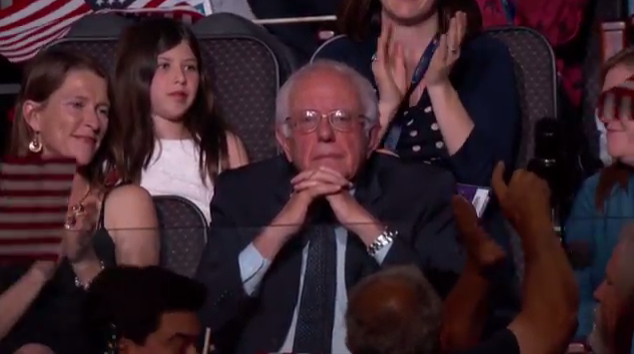 Bernie doesn't seem amused when Hillary Clinton was giving him a shout-out. Bill Clinton put me to sleep. So did President Barack Hussein Obama. They think America is going just great. Hillary Clinton's speech was so, um, good. Her delivery was perfect. Perfect tone, pitch, and tempo. Her message is just what America needs. She really made the convention. ...Yup. 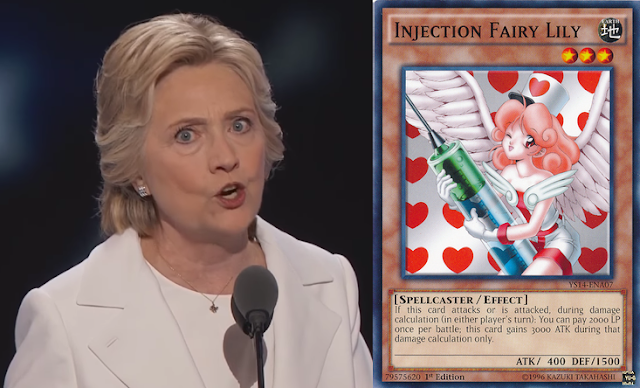 Hillary Clinton dressed like a nurse so she could HEAL America! ...It's just fine, however, and Obama is a great president! ...Okay, let's get to the truth of the matter: ClinCon was filled with lies and falsehoods. Everyone kept saying that Donald Trump doesn't have any specific plans. I mean, he has a website with an issues page with his plans all laid out, and it's the first tab at the top of his site. So... it's a lie to say he has no plans for healthcare, for example. They also kept lying about Trump's business record, constantly calling him a scammer and a con artist, using Trump University as an example. There was a speaker, Cheryl Lankford, who gave a story about how Donald Trump screwed her of the money the Department of Defense gave her after her veteran husband died, or something, by her enrollment into Trump University. She said it was a total scam. If that's the case, why does her professional website list her enrollment at Trump University as a qualification? “She has also been enrolled in Trump University.” In a paragraph about her qualifications and education. Check it out for yourself here before she removes it or something. Now, you tell me: If you thought you were participating in a scam, would you put that on what's basically a curriculum vitae? The site exists to establish her personal brand. She claimed in her speech that she was embarrassed to participate at Trump University. 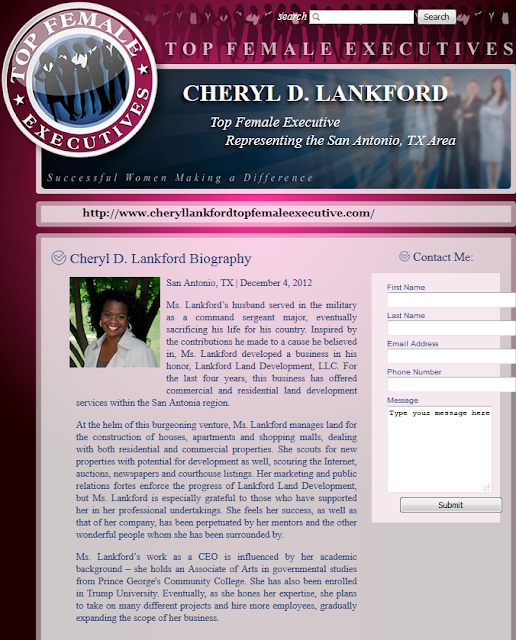 If she's trying to get hired as a “top female executive”, she wouldn't put “I'm a sucker with bad judgment” as a qualification. Unless, of course, she thought it was a good investment in yourself and she is just lying. I wonder how much she was compensated on the side for the speech. Though it wouldn't surprise me if she just lied on national television and exposed herself as a fool for no compensation. She does seem like a bad businesswoman. ...How bad of a businessman am I for watching this whole convention for free? It was torturous. The next thing to really look forward to between Hillary Clinton and Donald Trump are the presidential debates between them, taking place in September and October. KoopaTV will be all over that. In the meantime, KoopaTV will be keeping the candidates accountable in some way. Look forward to KoopaTV's OFFICIAL PRESIDENTIAL ENDORSEMENT pretty soon. KoopaTV guarantees you will be able to correctly guess who it'll be, and it won't be King Bowser Koopa. For the Fair & Balanced perspective on the Republican National Convention 2016, click here. It took until September, but the OFFICIAL PRESIDENTIAL ENDORSEMENT has arrived! They spent this whole convention trying to Stump the Trump and couldn't do it. I do feel like Trump needs to get out there and counter some of these narratives. I mean, they spent quite a bit of time attacking his business record, and now everyone thinks Trump is a bad businessman. But all he's BEEN is a businessman, and that's what he's running on. I dunno if the Trump campaign has figured out that they need to buy stuff on TV, not just write tweets. This is just him being really cost effective while running his campaign. He's talked about this before, but it's relatively easy for him to counter narratives like that merely by using social media, without having to blow millions of dollars on ads as they have been doing. See, the problem is that tens of millions of people watched the lies at the DNC. Trump's social media, while having enormous reach, doesn't reach that. Plus, the people most likely to follow him on social media are those who are already going to vote for him. You are braver than I was. I couldn't watch the convention for more than a few minutes before going insane. Who says I'm not insane? Erblicken die letzte Karte Bord Zeichen aufgehoben hinter Hellary, die zynisch und ungeheuerlich Bevölkerung einladen zu: "Liebe Trump's Haß" !!! Man sind offensichtlich beweisen, dass ich Vollkommen Recht gehabt habe, wenn ich im Schreiben habe erwartet die eminent voreingestellt, übertragen von H. Rod'Ham in die Anti-Emigranten Camp von D. Trump, innerhalb ihrer Bi-synchronisiert Chaos-schaffende Rahmen von deren versteckt Co-kombiniert Krypto-Grundstück, Gerichtet Auf Das Anstiften Und Schleppen Des Gewöhnlichen Amerikans IN DIE AMERIKAN AUSGABE DES "ARABISCHEN FRÜHLINGS" HYPER-ZERSTÖRUNG !!! ... (to be continued). -- Full English edition is posted under the title: BY WAY OF TRUMPING, BY WAY OF ROD-HAMMING, NON-QABBAALAS TO AVOID THE SEVEN RIVERS OF BLEEDING. BY WAY OF TRUMPING, BY WAY OF ROD-HAMMING, NON-QABBAALAHS HAVE TO FLEE BEFORE SNOWING !!! Like I have repeatedly pointed months ago, the pre-set Qabbaalah programmes of practicing turmoil and disruption and violence and havoc that were implemented in countries like: Zaire; Nigeria; Mexico; Ecuador; Venezuela; Georgia; Tunisia; Egypt; Libya; Syria; al-Yemen; Bahrain; Ukraine; Sudan; Mali; Senegal; Bosnia; Greece; Myanmar; Hong-Kong; Iraq; Iran; Pakistan; India; Brazil; Columbia; etc., were not meant only to practice depopulation and demolition upon those countries and their majorities, in-service of the super-irrational Qabbaalah Paganism. Additionaly, those diabolically mean and rave programmes of inflicting wide-scaled horrors and desolations against those countries and their extra-elite inhabitants were also set off to act like DRILLS AND REHEARSALS for applying them against the Greater Political Country-Unions and their extra-elite inhabitants, like those of: the United States of Amerika; the European Union; the Russian Federation; and the Confederated China !!!! Now, the turn of the U.S.A. Non-Qabbaalah Communities has come, including the Non-Qabbaalah Afros, despite the Qabbaalah Afro O-Bam-A is still in the White House !! To tread-away the final paces left to reach the goal of practicing turmoil and disruption and violence and havoc INSIDE AMERIKA, both Qabbaaly parties of: the Red Devildom pseudo-Republicans and the Blue Devildom pseudo-Democrats, with their pseudo-elections’ bi-teams employees and paid supporters, and with their civilians-looking secret agents who have been trained off-scenes on practicing street-and-square chaos, ARE ALL HEADING FIERCELY TO DRAG ALL NON-QABBAALAH COMMUNITIES TO A MOST INCREDIBLY MASSIVE MASSACRE THAT INCLUDES USING WEAPONS OF MASS DESTRUCTION AGAINST THEIR DWELLING QUARTERS !!!! I Further Warn: ‚‚TRUMPING‘‘ AND ‚‚ROD-HAMMING‘‘ are just Two Closely-Collaborative and Hyper-Synchronized Styles of the same and only Crypto-Unified ‚‚WAY OF DECEIVING‘‘, that is mentally and governmentally adopted in the Current Phase of Dragging the Extra-Elite Emigrants into the Prefabricated Circumstances of Mock Civil Unrest, and on their Diabolical Pre-Set General Path to Reach their Aimed-at Apocalyptic Situation of a « PERFECT DEATH STORM ». Note well how as soon as ‚The Rod-Hammy‘ suffered the zombie-syndrome manifestation on 11th September 2016, she suddenly and reasonlessly played the Obama-Birthering ball into the waiting hands of ‚The Trumpy‘, so that he gets a misty chance to announce the ‚End of the U.S.A.‘, with his shocking phrase: “Obama was born in the United States‘ Period“ !!! Put this besides the very matching improvised statement of Obama’s presidency’s 2013 renewal: “… the responsibilities of the president of THE UNITED STATE“, instead of the 2009 normal: “… the responsibilities of the president of THE UNITED STATES OF AMERIKA“, which is a temporary political entity that is apparently ALREADY ABOLISHED !!! Hour by hour now: watch how their Secret-Militia agents are instigatingly performing mini-operations of obvious mimic-terrorism, and then again-instigatingly both Qabbaaly parties of pseudo-Republicans and pseudo-Democrats are falsely accusing the Non-Qabbaalah Emigrants for committing them ; and watch how Their Qabbaala-Ancestored Blacks are collaborating with them to forge their announced false killings, to be as para-excuses for their OWN START-UPS of demonstrating and confronting the police and the army ; and watch how their White and Black civilians-looking secret agents of practicing street-and-square chaos are trying to lead their victims into the clashes with the police and army, and then how they withdraw themselves together upon the ringing or messaging of their mobilephones by their hidden controllers, and only then, when those deceptive agents disapear – with their marked-caps and shamlas and bala-klavas and back-bags – do the police and army Hit Hard at the remainder of the people, who would be the Qabbaala-victims ordinary Amerikan people !!! Notice also closely, after a long series of Government-Forged Explosions and Shootings and Clashes and Sit-ins, how „The Rod-Hammy“ will suddenly sway away her moderate-looking stances and jump into the insane thought-stream of „The Trumpy“ campaign, claiming that it was he who was Very Right about the Necessity of Facing the Social Threats with HARD AND HARSH MEASURES !!!! The chief problem is that they widely share the same Qabbaalah Mental Virus, and they are baselessly afraid that they would be Satan-punished if they did not realize the horrible vast crimes that Satan dictates upon their hyper-troubled minds. — Hence, non-Qabbaals are advised to sell away what they can of their properties and flee out of the country of the Ex United States of Amerika !!! POR VÍA DE TRUMPING, POR VÍA DE ROD-HAMMING, NO-QABBAALAHS PARA EVITAR LOS SIETE RÍOS DE SANGRÍA !!! Contemple los últimos signos de cartón levantados detrás de Hellary, que con cinismo y flagrantemente invitan a la gente a: "Ame Trump's Odio" !!! Ellos obviamente demuestran que He tenido perfectamente correcto por-escrito, cuando he esperando la Transferencia eminente predeterminada de H. Rod'Ham En-Por El Campo de los Antiemigrantes de D. Trump, Dentro de Sus Bi-Synchronized Caos-Generando Marco de Sus Crypto-complot Ocultado Co-combinado, Apuntado a la Instigación y Arrastramiento de Americanos Ordinario EN LA EDICIÓN AMERICAN "DE LA PRIMAVERA ÁRABE" HIPER-DESTRUCCIÓN !!! Cuando este salto de transferencia de Hellary se produce por completo, y cada uno entiende entonces que el Dice del 'Trumpy' Eran De hecho el Dice de el 'Establecimiento Crypto-unificado' del Qabbaala, aquellos emigrantes del Non-Qabbaala que imprudentemente o tontamente había aceptado el CAMINO TRUMPING\ROD'HAMMING DE ENGAÑO, de repente sentirán que ellos están siendo "pan-traicionados" y "abandonados en el frío", y de ahí sujetados a las Consecuencias de Superdesolación Hipersangrientas de no Rechazar los Bi-estilos Trump-Plus-Rodham Mortales Qabbaaly el Camino de Engaño. (... to be completed). BY WAY OF TRUMPING, BY WAY OF ROD-HAMMING, NON-QABBAALAHS TO AVOID THE SEVEN-RIVERS OF BLEEDING !!! Behold the latest card-board signs lifted behind Hellary that cynically and flagrantly invite people to: „Love Trump’s Hate“ !!! They are obviously proving that I have been Perfectly Right when I have writtenly expected the eminent pre-set Transfer Of H. Rod’Ham Into The Anti-Emigrants’ Camp Of D. Trump, Within Their Bi-Synchronized Chaos-Generating Framework Of Their Hidden Co-Combined Crypto-Plot, Aimed At The Instigating And Dragging Of The Ordinary Amerikans INTO THE AMERIKAN EDITION OF THE „ARAB SPRING“ HYPER-DESTRUCTION !!! When this jump-transfer of Hellary fully occurs, and everybody understands then that the “Says Of The ‚Trumpy‘ Were In-Fact The Says Of The ‚Crypto-Unified Establishment‘ Of The Qabbaala“, those emigrants of The Non-Qabbaala who had unwisely or foolishly accepted the TRUMPING\ROD’HAMMING WAY OF DECEPTION, shall suddenly feel that they are being pan-betrayed and left-in-the-cold, and hence subjected to the Hyper-Bleeding Super-Desolation Consequences Of Not Rejecting The Trump-Plus-Rodham Lethal Qabbaaly Bi-Styles Way Of Deception. According to a number of virtual ‚By Way Of Deception‘ sources: “The Amerikan flag consists of thirteen horizontal stripes, seven red alternating with six white. The stripes represent the original thirteen colonies…“. The second phrase looks like a Huge Deceitful Lie, in view of the historical past omission of the previous blue stripes of a former flag of the 18th centuary and the keeping of the white ones, and in view of what was said repeatedly about the red stripes representation of the „RIVERS OF BLOOD“ or the „SEVEN RIVERS OF BLOOD“ !!! Asserting this acutely-horrific threat, is the mega-shocking scene in the Qabbaala-produced „I, Pet Goat II“ cartoon film, where the Amerikan Flag Is Being Torn Into Two Halves and then Two Human-Shaped Towers Get Demolished From Top To Bottom !!! This is no-doubt a Qabbaaly Proclamation of „A Pan-Amerikan Massacre Against The Goyeem’s Whole In Amerika“ !!! I have previously warned against the Severe Dangers Of The Non-Qabbaala Emigrants’ Extended Stay Inside The Ex United States Of Amerika, and against their uncareful subjecting of themselves to the same mercilessly executed types of the drilled and rehearsed brutal acts that we have painfully beheld in THE „ARAB SPRING“ COUNTRIES, like: Iraq; Syria; Libya; al-Yemen; Tunisia; Egypt; Sudan; etc. Now, if the expected shutdowns of numerous landports and airports and seaports are started up, the selling of the Non-Qabbaala Emigrants’ possessions and their escaping out of the U.S.A. territories shall become sadly badly difficult. If so shall become the critical situation for them, then at least The Non-Qabbaala Emigrants’ Families May ‚INSIST‘ Among Themselves On Side-Stepping The Hazardous ‚Sleep-Walking‘ Acts Behind The Qabbaala Tyrants’ Chaos-Begining Gangs, as they try to lure them to follow them into their Trappy and Artificial: Demonstrations; Sit-Ins; Clashes; Sabotage-Blows; etc. FOR YOUR SERIOUSLY ENDANGERED SAFTIES, DO NOT DO AS THOSE GOVERNMENTAL SECRET AGENTS DO AT ANY SITUATION WHAT SO EVER. THE GOVERNMENTAL FORCES SHALL SPARE THEM, WITH THEIR MARKED CAPS AND BALA’KLAVAS AND SHAMLAS AND BACK BAGS, AND THEIR HIDING CONTROLLERS SHALL ORDER THEM TO LEAVE THE CHAOTIC SCENES THROUGH SILENT MOBILE RINGINGS AND TEXT MESSAGES, AND THAT SHALL HAPPEN WHEN THOSE CONFRONTATION SCENES ARE FILLED WITH NON-QABBAALA VICTIMS. THEN THOSE GOVERNMENTAL FORCES SHALL START TO HIT HARD AND HARSH AT THE TRICKED TRAPPED PEOPLE. ARTIFICIAL ESCALATIONS SHALL FOLLOW SOON, LARGELY BY USE OF MIMIC-TERRORISM OPERATIONS, AND IF THE ORDINARY AMERIKAN EMIGRANTS SHALL NOT REJECT THOSE SLY NEFARIOUS FORGERIES AT ONCE, THE QABBAALAS SHALL ESCALATE ALMOST ENDLESSLY, UNTILL THEY SHED THEIR FLAG-DEPICTED „RIVERS OF BLEEDING“, BY WIDE USE WEAPONS OF MASS DESTRUCTION INSIDE THE EX UNITED STATES OF AMERIKA !!!!! WTH have you been smoking!? I'll vote for whoever I please. A Continuation To : BY WAY OF TRUMPING, BY WAY OF ROD-HAMMING, NON-QABBAALAHS TO AVOID THE SEVEN-RIVERS OF BLEEDING !!! In addition to the almost pre-expected abolishment of "Lock Her (Hellary) Up", here is a new bomb-present for those who's minds still ponder in awe about the tremendous extents to which have gone the flagrant tasks of aiding Donald's rise by Barack and Hillary, and whether all that had popped-up according to a pre-written conspiracy script : Three years before the declaration of an acutely forged Trump Triumph on 11/9, the Qabbaala-made cartoon film "I, Pet Goat II" featured a shot of a near-future B. Husein O. with an eerie look on his face, and a drop of sweat coming down his forehead with the Hebrew Letter "ד" on it, which in the Rashi and Serif scripts means the "Dalet"/"Dee" letter, i.e. the FIRST LETTER OF THE NAME "DONALD" !!! Swiftly this is followed by a shot of TEARING-UP THE AMERIKAN FLAG INTO 2 HALVES, then a shot of DEMOLISHING THE MALES AND FEMALES 'TOWERS' OF AMERIKA, and then a shot of a DEMON'S DANCE OVER THE MEANT SUPER-EXCESSIVE POLY-DEATH !!! Now The Previously Hidden Names, Of The ALL-QABBAALA Members Of The History's Greatest Partial Collusion In Amerika, JUST KEEP TO BOUNCE IN FRONT OF US BY THE HOUR ! Take as examples Mitt Romney and Nikki Haley, whom till last week were thought to be Semi-Wise Anti-Annihilation Humans, and today are hurdling to join-in fast in the "Seven Rivers Of Bleeding" pre-planned massacre against the Non-Qabbaala Amerikans. Over there in Eurasia, the Names Of The Colluding Famous Blood-Thirsty Qabbaala Figures ALSO KEEP TO BOUNCE IN FRONT OF US BY THE HOUR ! Take as examples Vladimir Putin and Marine Le_Pen, and Nigel Farage who advertised lately a Chilling Poster that shows A Killable-Walking-Emigrants Arced Column, that is identical with the 1960s matching "Rivers Of Blood" Poster !! Years in-advance, the launching of the Qabbaalian Top Slavemason/ Ba-Rack O-Bam-A, as a White House In-Agency Dweller, was accompanied with his misunderstood "CHANGE" Label, and it turned out that it actually showed that the Flag's "Red Stripes" were not indicating any "Early States", but in-fact were indicating "BLOODY RIVERS FLOWING ON THE SPHERICAL SURFACE OF THE EARTH" !!! But don't get over-freaked to the extent of fainting in-horror or stopping to think calmly about how to escape the "THE 7 RIVERS OF BLEEDING". You want a good reason for that !? : The qabbaalas methodically present preliminary-introductory measurements or procedures when they are about to Launch Major Global Crimes. In the case of their intended "Rivers Of Blood" super-atrocities play-out, they are expected to use first Red Chemical Paints, by pouring large quantities of them into numerous American rivers and their wide branches. Another known option is the substitution of the Artificial Paints with large quantities of Reddish Volcanic Eruptions Ash, which could be collected and imported secretly to America from Chile or Japan, and they also are able to cause waterways to appear like startling blood streams. A yet additional - and likely - option to do that dreadful job is the deliberate increase in Blood-Redding the existing rivers with what the Biology scientists attribute to a type of toxic algae, known as Euglena Sanguinea. This protist of the genus Euglena can emit abundant Red Colour, due to the presence of astaxanthin, and its cells can be populous enough to colour large waters in Bloodred, and that ability conforms with the term "Sanguinea" which means "Sanguineous" or the simpler to understand "Bloody". Eine Weiterführung Zu : DURCH WEG DAS TRUMPEN, DURCH WEG DAS ROD-HAMMEN, NICHT-QABBAALAN ZU VERMEIDEN UM DIE SIEBEN FLÜSSE DER BLUTUNGEN !!! A Continuation To : BY WAY OF TRUMPING, BY WAY OF ROD-HAMMING, NON-QABBAALAS TO AVOID THE SEVEN-RIVERS OF BLEEDING !!! In addition to the almost pre-expected abolishment of the “Lock Her (Hellary) Up„ quasi-slogan, here is a new bomb-present for those who’s minds still ponder in awe about the tremendous extents to which have gone the flagrant tasks of aiding Donald’s rise by Barack and Hillary, and whether all that had popped-up according to a pre-written conspiracy script : Three years before the declaration of an acutely forged Trump Triumph on 11/9, the Qabbaala-made cartoon film “I, Pet Goat II„ featured a shot of a near-future B. Husein O. with an eery-edgy look on his face, and a drop of sweat coming down his forehead with the Hebrew Letter “ד„ on it, which in the Rashi and Serif scripts means the “Dalet„/“Dee„ letter, the FIRST LETTER OF THE NAME “DONALD„ !!! Swiftly this is followed by a shot of TEARING-UP THE AMERIKAN FLAG INTO 2 HALVES, then a shot of DEMOLISHING THE MALES AND FEMALES ‘TOWERS’ OF AMERIKA, and then a shot of a DEMON’S DANCE OVER THE MEANT SUPER-EXCESSIVE POLY-DEATH !!! – This alone may hint-out to us why that hired-slaughterer Do’Mald Trump was wearing a necktie that displayed an image of Plenty Bloodred Rivers Flowing Diagonally, and why he stood in front of a big panel of a Massive Waved Bloodred River depicted upon its surface. When the forged elections forged result was announced by the TV Channel "C.N.N." ( which is advertising the #Christsubstitute Now Now/C.N.N.# evil slogan ), the TV presenters plateau was cut into 2 right and left sides, with also a Startling Bloodred Stream, visually heading through the flooring to the Results Display Inner Screen !! Now, The Previously Hidden Names, Of The ALL-QABBAALA Members Of The History’s Greatest Partial Collusion In Amerika, JUST KEEP TO BOUNCE IN FRONT OF US BY THE HOUR ! Take as examples Mitt Romney and Nikki Haley, whom till last week were thought to be Semi-Wise Anti-Annihilation Humans, and today are hurdling to join-in fast in the “Seven Rivers Of Bleeding„ pre-planned massacre against the Non-Qabbaala Amerikans. Over there in Eurasia, the Names Of The Colluding Famous Blood-Thirsty Qabbaala Figures ALSO KEEP TO BOUNCE IN FRONT OF US BY THE HOUR ! Take as examples Vladimir Putin and Marine Le_Pen, and Nigel Farage who advertised lately a Chilling Poster that shows A Killable-Walking-Emigrants Arced Column, that is identical with the 1960s matching “Rivers Of Blood„ Poster !! Years in-advance, the launching of the Qabbaalian Top Slavemason/ Ba-Rack O-Bam-A, as a White House In-Agency Dweller, was accompanied with his misunderstood “CHANGE„ Label, and it turned out that it actually showed that the Flag’s “Red Stripes„ were not indicating any “7 of 13 Early Amerikan States„, but in-fact were indicating “BLOODY RIVERS FLOWING ON THE SPHERICAL SURFACE OF THE EARTH„ !!! Lunatically enough, like Trump's Wife was speech-copying Obama's Wife, the launching of the Qabbaalian Top Slavemason/ Do-Mald Tru-M-P, as a White House In-Agency Dweller-To-Be, was accompanied with his misunderstood “MAKE AMERIKA CREAT AGAIN„ Label, and it turned out that it *also* actually showed that the Flag’s “Red Stripes„ were not indicating any “7 of 13 Early Amerikan States„, but in-fact were indicating “BLOODY RIVERS FLOWING ON THE SLOPED SURFACE OF SOME STATES„ !!! – Thereby, the Crazy Stampeding towards a Long Streak of Ruthless Massacres against Non-Qabbaalian Blacks and Others was pre-planned and pre-prepared long ago and the ‘Supposed Black’ Barack was hired and brought into the White House to CAMOUFLAGE IT OUT FROM THE PEOPLES’ EXPECTATION FROM THE BEGINNING OF HIS PERIOD. And in turn that is why HE AND HIS “DEMONRATIC„ GOVERNING SYSTEM ARE COLLABORATINGLY DOING *PURE NOTHING* TO SAVE THE AMERIKAN PEOPLE MAJORITY AND HALT THE ALT-RIGHT GANGS AND THE … ETC. But don’t get over-freaked to the extent of fainting in-horror or stopping to think calmly about how to escape “THE 7 RIVERS OF BLEEDING„. You want a good reason for that !? : The qabbaalas methodically present preliminary-introductory measurements or procedures when they are about to Launch Major Global Crimes. In the case of their intended “Rivers Of Blood„ super-atrocities play-out, they are expected to use first Red Chemical Paints, by pouring large quantities of them into numerous American rivers and their wide branches. Another known option is the substitution of the Artificial Paints with large quantities of Reddish Volcanic Eruptions Ash, which could be collected and imported secretly to America from Chile or Japan, and they also are able to cause waterways to appear like startling blood streams. A yet additional – and likely – option to do that dreadful job is the deliberate increase in Blood-Redding the existing rivers with what the Biology scientists attribute to a type of toxic algae, known as Euglena Sanguinea. This protist of the genus Euglena can emit abundant Red Colour, due to the presence of astaxanthin, and its cells can be populous enough to colour large waters in Bloodred, and that ability conforms with the term “Sanguinea„ which means “Sanguineous„ or the simpler to understand “Bloody„. The Qabbaalian writer Aldous Leonard Huxley plainly confessed, just before 85 years from now, that his fellow Qabbaalians' completion of their Devil-Plus-Ford-Guided world state shall demand a tremendously-super-massive pagan offering of human bodies, of a given astronomical number of victims : A Thousand Thousand Thousand (= A Billion). The world-state-building black witchcraft that is needed, according to their lucifer-inspired nonsense delusions, has to be pre-fed abundantly with the corpses of persons and animals and plants. Lately and now-a-days, the Qabbaalians are 'warming-up' by sacrificing 'human-samples' in 100s and 1000s and 10000s, in Qabbaala-Governed countries like : Syria ; Iraq ; Yaman ; Libya ; Egypt ; Ukraine , Myanmar ; etc. The real big ultra-super killing show, across the Pacific Ocean, is being almost crudely introduced in the qabbaala-controlled channels, right now already. To make it work at the exact sought timing of the human-sacrificing global operation, and in order to be able to escalate it to the exact sought scale in terms of helping in attaining "The Thousand Thousand Thousand Number of Assassinated Mortals", they taught and trained by themselves, in their special centers in Switzerland, their Sins-Bearer "Rocket-Man". And gave him the super-long-ranged rockets, which of course he cannot pay for their astronomical costs, so-that the "Billion-Corpses-Making" back and forth volleying of nukes becomes on and on-the-go. -- And all that comes with a couple of telling real black-jokes attached to the gigantic-mass-criminality issue : 1. A C.N.N. presenter obviously confessed that the North Korean sins-bearer was only 'A Few Yards Away' from the North American sins-bearer (!!! ), when they met secretly in Peking's "Forbidden City" upon their ongoing collusion against their own non-qabbaala peoples. ; 2. The farthest reaching nukes-bearing rockets, that the qabbaalian chiefs have given by themselves to their North Korean Deputy, to start and propagate the WWIII Nuclear Inferno, so happened - and oh yeh they so-happened - that they ALL 'Fall Short' exactly by mere few yards from ALL the Chief Amerikan Qabbaala Dens, in North-Eastern Amerika, so as that incredibly 'accurate' limitation becomes an excuse for them on why those East-dwelling conspiring leaders are not slain and fried, together with 10s of Millions of non-qabbaala Amerikans (!!! ).